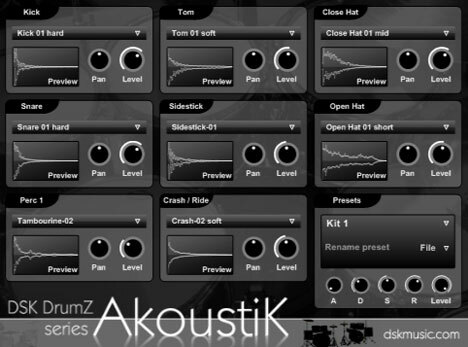 DSK DrumZ AkoustiK is an acoustic drums module. In the fast development of electronic music, digital instrument like drums have been made into electronic modules. However, some music, for some music producers, acoustic sounds still matter. The presence of acoustic drum sounds are required to get the vintage music touch. The best acoustic drum module vst in the present day may be that of BFD fx pansion that require a music producer to grab some money in the wallet. Don’t worry if you like the free one for testing or experimental project. There is the best free acoustic drum module vst plugin for your DAW to complete your music composition project. Here you are another great free vst plugin fom DSK. 4 full kits + extra sounds.